Campbell Scientific dataloggers have recorded water level, temperature, and conductivity in the ice-covered lakes of the McMurdo Dry Valley in Antarctica; measured net radiometer, soil temperature, and soil heat flux in the flooded rice fields of Cuttack, Odisha, India; and monitored slope stability above a critical section of railway track in San Diego County, California, USA. 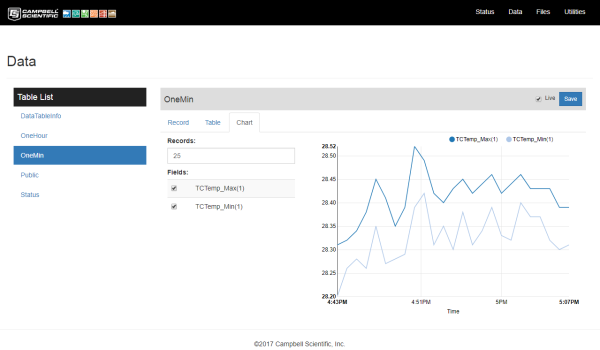 These are just a few examples of what Campbell Scientific dataloggers are designed to do, and to do very well. The CR1000X, our newest datalogger, sets a new standard for reliability and accuracy for long-term data collection. To create the CR1000X, Campbell Scientific integrated the successful features of the CR1000 with many of the elements of the CR6. The resulting datalogger is rugged enough for extreme conditions and has a reliability that makes it an excellent choice for remote environmental applications where data integrity is vital—such as weather stations, mesonets, wind profiling, air-quality monitoring, hydrological systems, water-quality monitoring, and hydromet stations. The CR1000X is a low-powered device that measures sensors, drives direct communication and telecommunications, analyzes data, controls external devices, and stores data and programs in onboard, nonvolatile storage. Its wiring panel includes two switchable 12 V terminals and analog grounds dispersed among 16 analog terminals for measuring between 4 and 10 sensors (typical of full meteorological, agricultural, and hydrological/water quality monitoring systems). The electronics are protected and RF-shielded by a sealed, stainless-steel canister. Embedded web-page user interface that simplifies viewing real-time and logged data in the field. The CR1000X processor allows the interface to be significantly more responsive than the CR1000 web-page interface. Ability to natively connect analog current sensors (0 to 20 mA or 4 to 20 mA), RS-485 devices, and Campbell Distributed Devices (CDMs). This eliminates the need for peripheral devices, which reduces the overall cost of your monitoring system and simplifies installation. Rugged construction and wide operation-temperature range for operation in extreme climate conditions. The standard operating temperature range of -40° to +70°C meets the needs of most applications. For extreme environments, the CR1000X also provides an optional extended operating temperature range of -55° to +85°. Customers who have setup accounts on www.campbellsci.com/customer-center have access to a calibration certificate for their CR1000X at no charge. Save the paper, go electronic! The CR1000X uses the same physical design and footprint as the CR1000, which allows the CR1000X to fit seamlessly into an existing network of CR1000s. Although they are programmed similarly, an old CR1000 program may require some modifications for it to work with the CR1000X. 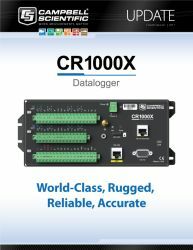 Refer to the "Replacing Your CR1000 Datalogger with a CR1000X: What You Should Know" blog article for more information. The CR1000X is recommended over the CR1000 for new applications. However, the CR1000 will remain available until December 2019 for existing CR1000 customers who do not need the new capabilities. Campbell Scientific will continue to provide customer support for the CR1000 until December of 2029, assuming parts remain available.